We were given the opportunity to review string Heart LED lights and a Sandcastle lamp from Lava. The heart string lights are a new novelty line from Lava. These lights feature color changing LED lights that are battery operated. I think the string of LED heart lights are so cute. There are many possibilities for using these string lights. You could also use them on a mantle or in a window. Teenagers will love these LED lights, use them in a dorm room. As a DIYer I could think of different crafts I would use them for. No need to replace the worn out window lights from last year these would look awesome. You could even make them a new tradition for this Christmas. 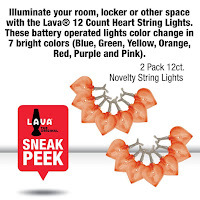 Lava has different options for the battery operated LED pull and string lights. There were two new sets added recently, the hearts and star lights. No wall source is needed to use these string lights. The lights can be added to any space with pull lights or color changing string lights, which are available in stars, hearts, bows, flip flops, Popsicles, flamingos and the lava lamp iconic shape. Use those star lights to trim your Christmas tree. Don't pack them away after the holiday find another fun spot for them! The Heart string lights come two in a package for $19.99. Lava has so many beautiful new lava lamps to choose from. I just couldn't decide so I asked to be surprised. I couldn't have chosen better myself. They sent me the Sandcastle lamp. It is very pretty and I love castles. It is filled with gold glitter that swirls around and makes it look so beautiful. Someday I will visit some old castles in Ireland and England. It's definitely a part of my bucket list. The Sandcastle lamp will leave you feeling like you just visited the beach. Gold Glitters swirl around the Sandcastle making it seem magical. It has two color-changing LEDs in white and blue. It sits on a plastic base and plugs into a power outlet. A 4.5V adapter is included. The Sandcastle is inside an nostalgic lava lamp shape in a soft blue colored base. It creates such a happy feeling watching the gold "sand" glitter swirl around the sandcastle, while the LEDs change from blue to white. The lamp is 14.5" and can be purchased for only $24.99. Lava is an iconic brand that has been beloved by people of all ages for over 50 years. It's one of the most recognized consumer shapes of all time. The lava lamps continually are innovating to keep up with new technology and trends. Their quality is second to none. Clay Farnsworth, president and CEO says "While we celebrate our iconic brand and heritage, we are always looking to the future and pushing Innovation." Their team is constantly refreshing their products to stay on top of current trends and introducing new novelty lighting that steps out of their iconic shape, so they can offer a well-rounded exciting product line. Facebook, @LavaLamp, and Their Website . I have always wanted a lava lamp but never seemed to remember to get one! I think I would enjoy the mini volcano lamp. I love that it is battery operated. I could see me staring at it for hours mesmerized. I really like the mini volcano lamp also. What a timely post. My teen daughter was finishing up her Christmas gift wish list last night and asked for a Lava Lamp. Going to check out the Gltter chlak board one for her. Thanks! The lava lamps make for great gift ideas for anyone. I actually have never owned one but will be checking the Sandcastle one out. The Heart and the Star sting lights are two things I would love to have too. Thanks for sharing these awesome items. The Chalk Board is the one my son wants.